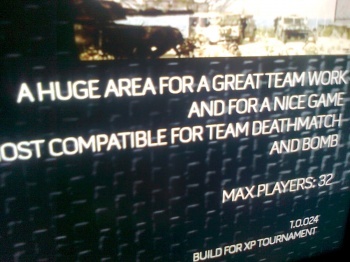 A leaked video also hints at a new gameplay mode for Modern Warfare 3, simply called "Bomb." It seems that the multiplayer maps in Modern Warfare 3 might be a little more spacious than those of its predecessor with the maximum number of players increasing from 18 to 32. That's according to a short video that purports to show a build of the game that Activision plans to use at the Call of Duty XP event later this week. The video, which has since been removed from YouTube, showed someone navigating through the game's multiplayer menu. Besides showing the increased map sizes, the video showed that the game currently has thirteen multiplayer maps, with names like "Carbon," "Paris," and "Seatown." It also showed a multiplayer mode called simply "Bomb," with no other details about what it is. It could be anything from the Call of Duty version of Counter Strike, to an unexpected remake of Kaboom!. The second one is probably the most likely; let's not forget that Treyarch put Zork in Black Ops. I must admit though, that I'm a little skeptical about the veracity of the video itself. The story - that the person behind the video broke into the venue for CoD XP - is certainly plausible , but it raises a lot of questions. There's also the fact that the description you can see in the still from the video isn't the best English in the world. It's hardly conclusive that it's a fake - people make typos all the time - but it does raise another question mark over it all. Of course, if it is a fake, it seems like a fairly elaborate one. Activision's stance on the video is that it doesn't comment on rumors or speculation, but the CoD XP convention is just around the corner, so we'll get our answer soon enough. Call of Duty: Modern Warfare 3 comes out for PC, PS3, and Xbox 360 on November 8th.